This Friday collective cooking is with a new group of people in physics and/or mathematics recently received their Bachelor degree. As a group of first-timers, the event was a great success. Here is a delicious and simple appetizer, no cooking required made by a great couple. 1. 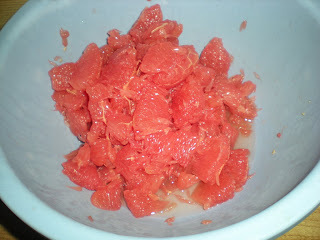 Peel grapefruit with its skin removed and put into a large bowl. 2. 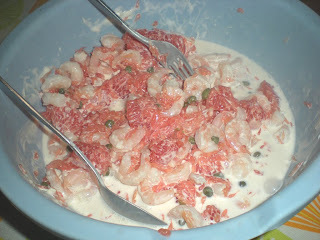 Add the cooked shrimp and capers. 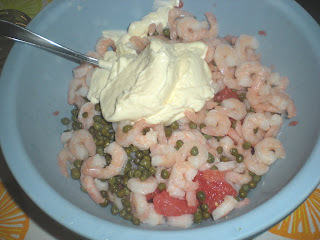 Carefully mix with mayonnaise. White cabbage, that's interesting I should try this next time. Sounds and looks delish. My hubby, John Price, is a condensed matter physicist at CU Boulder. It's so fun to check out other physicists' culinary talents!